In a recent commentary in Nature, Andrew Bradbury and Andreas Plückthun highlighted the need for recombinant antibodies to achieve higher reproducibility in research. This way, the use of recombinant antibodies will also help save research funding. Recombinant antibodies are derived from a defined genetic sequence and generated in vitro. Sources of the antibody-encoding gene are either antigen-stimulated B cells or hybridomas, the latter of which are an excellent source of monospecific antibodies. Alternatively, the gene sequence is generated synthetically. The antibody-specific gene is then cloned into a high-expression vector. Subsequently, the antibody is produced in a suitable expression system such as mammalian cells. What are the advantages of recombinant antibodies? Recombinant antibodies are derived from a defined set of genes, and the production process is highly standardized. Therefore, these antibodies are consistent in their structure and performance, leading to high experimental reproducibility. 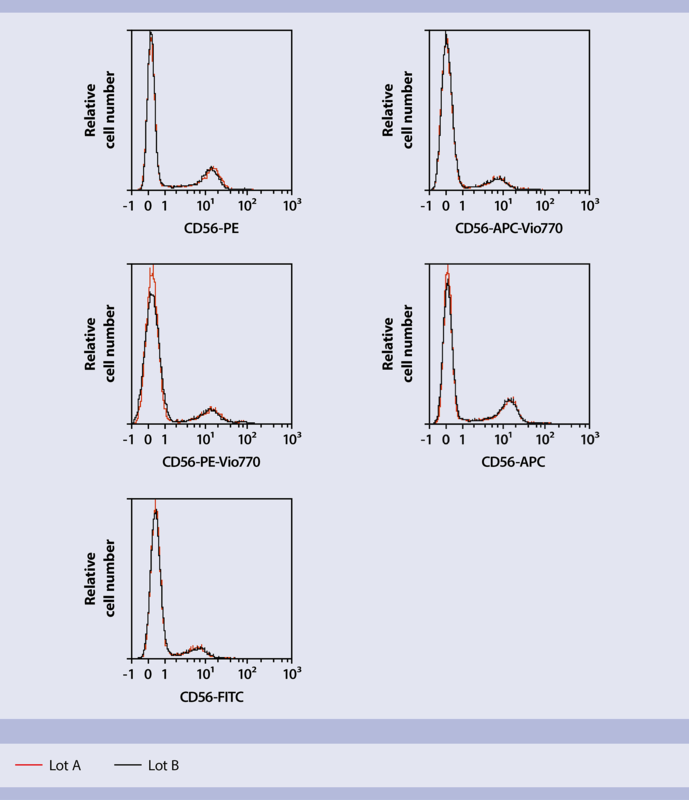 Figure: Human PBMCs from a single donor were stained with CD56 antibodies conjugated to FITC, PE, APC, APC-Vio770, or PE-Vio770 from two different production lots, and analyzed on the MACSQuant® Analyzer. The overlayed histograms represent the different lots. Tandem Signal Enhancer (# 130-099-888) was used to increase stain indices of tandem dye–conjugated antibodies. Cell debris and dead cells were excluded from the analysis based on scatter signals and PI fluorescence. In case of staining with CD56 conjugated to tandem dyes, DAPI was used to exclude dead cells from the analysis. 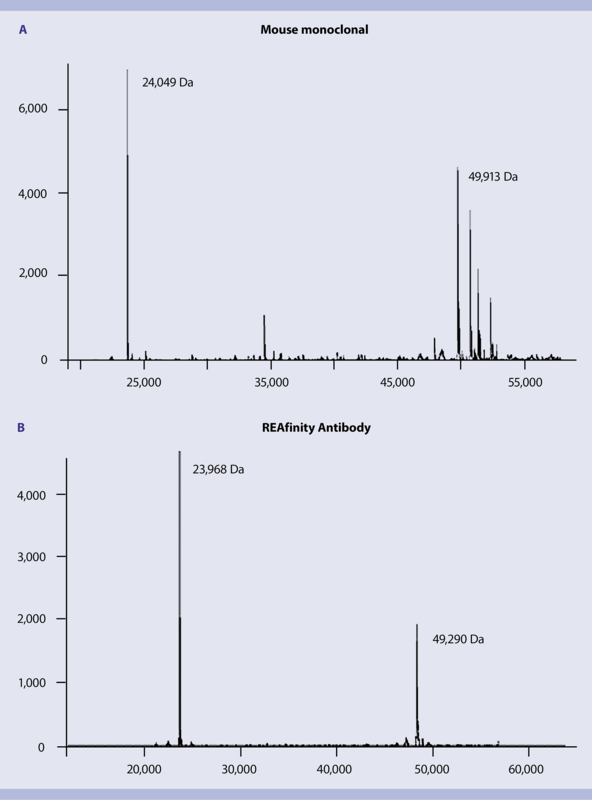 Figure: Mass spectometry analysis of mouse monoclonal (A) and REAfinity Antibody samples (B). Recombinant antibodies generated in artificial expression systems do not contain contaminants from serum and myeloma cell–derived immunoglobulin (Ig) light chains. Therefore, these antibodies are highly pure. Contaminating Ig chains, which are commonly present in traditional antibody preparations, not only result in batch variation but also affect the specificity of the antibody. Figure: A mixture of antibody chains can be observed in the case of the mouse monoclonal antibody while the REA clone only shows one heavy chain (50 kDa) and one light chain (25 kDa). Mass spectometry analysis of mouse monoclonal (A) and REAfinity Antibody samples (B). A mixture of Ig heavy and light chains can be observed in the mouse monoclonal antibody sample (A), whereas the REA clone (B) shows only one heavy chain (50 kDa) and one light chain (24 kDa). Figure: REAfinity Antibodies show low background signals. Since the gene sequence of a recombinant antibody is known, it is easy to modify the sequence to improve the properties of the antibody. For example, REAfinity™ Antibodies from Miltenyi Biotec are engineered to lack binding to FCγ Receptor. Thus, they do not show any background binding to naturally occurring FCγ Receptors, resulting in a higher signal specificity during cell analysis. 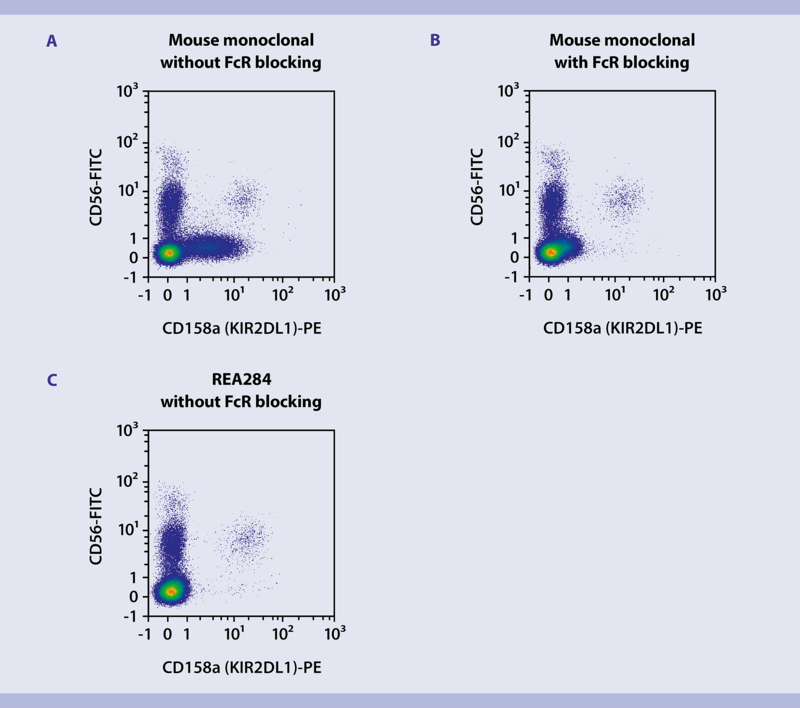 Figure: PBMCs were stained with a PE-conjugated REAfinity Antibody (C) and a mouse monoclonal PE-conjugated antibody (A, B) recognizing CD158a. Additionally staining with CD56-FITC (# 130-100-746) was performed followed by flow cytometrical analysis on the MACSQuant Analyzer. The staining with the mouse monoclonal antibody conjugate was performed either with (A) or without (B) the pre-treatment with FcR Blocking Reagent, whereas no FcR blocking reagent was included prior to staining with the REAfinity Antibody (C). Cell debris and dead cells were excluded from the analysis based on scatter signals and PI fluorescence. Staining of cells with a mouse monoclonal antibody or a REAfinityTM Antibody in the absence or presence of FcR blocking reagent. PBMCs were stained with a PE-conjugated REAfinity Antibody (C) and a mouse monoclonal PE-conjugated antibody (A, B) recognizing CD158a. Additionally staining with CD56-FITC (# 130-100-746) was performed followed by flow cytometrical analysis on the MACSQuant Analyzer. The staining with the mouse monoclonal antibody conjugate was performed either with (A) or without (B) the pre-treatment with FcR Blocking Reagent, whereas no FcR blocking reagent was included prior to staining with the REAfinity Antibody (C). Cell debris and dead cells were excluded from the analysis based on scatter signals and PI fluorescence. Learn more about the REAfinity range of monoclonal antibodies and how they can improve the quality of your research. Bradbury, A. and Plückthun, A. (2015) Reproducibility: Standardize antibodies used in research. Nature. 518: 27–29. Geyer, C.R. et al. (2012) Recombinant antibodies and in vitro selection technologies.